Strong legal protections for people living with HIV are essential prerequisites to effective risk-reduction and prevention strategies. By fighting discrimination based on HIV status, protecting people’s privacy, and improving access to information about HIV-related legal issues, we can strengthen the health of our communities. GLAD’s AIDS Law Project continues to fight for strong privacy protections for HIV status and medical information, and to educate the public about the consent requirements for HIV testing across New England. Because the laws vary from state to state, it’s important to understand what is and is not allowed or required where you live. Read on for an overview, and visit www.glad.org or contact our Legal InfoLine for more information. What HIV testing privacy protections exist in New England? Connecticut, Maine, Massachusetts, New Hampshire and Rhode Island all have HIV-specific laws that require a patient’s written consent for HIV results to be released by a doctor or medical facility. While there is no HIV-specific law in Vermont, under general common law principles, health providers cannot disclose private medical information to others without the patient’s consent. Are there any circumstances under which a person’s HIV status can be disclosed by a health provider without the patient’s consent? In Maine and Massachusetts, the answer to this question is no. As mentioned above, Vermont has no specific laws related to HIV and general medical disclosure laws apply. o to a blood donation agency. o when a first responder is has sufficient exposure to create a risk of transmission. What kind of consent is required to be tested for HIV? · CONNECTICUT—A general consent for medical care is sufficient as long as the general consent contains an instruction to the patient that the patient may be tested for HIV unless the patient indicates when giving the general consent that he/she doesn’t want to be tested for HIV. The burden is on the patient to communicate a refusal to the healthcare provider. 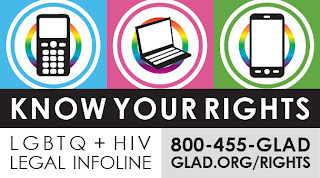 · MAINE—A patient must be informed orally or in writing that an HIV test will be performed unless the patient declines. The law also requires that the patient must be told before the test the meaning of positive and negative test results and be given the opportunity to ask questions. · MASSACHUSETTS—Only verbal informed consent is required each time an HIV test is performed. · NEW HAMPSHIRE—Only verbal consent is required each time an HIV test is performed. o orally consent to the test. · VERMONT—No specific consent is required, so an HIV test may be done based on a general medical consent. Can an HIV test be performed against a person’s wishes? o on an inmate if the person’s behavior poses a significant risk of transmission. o if a woman gives birth to a child and she has not had an HIV test, the health care provider must administer an HIV test to the newborn. o testing of pregnant women and newborns. o emergency medical situations where it is not possible to get the consent of the patient. · VERMONT—Yes, when a court orders that a person convicted of a sexual assault be tested. Can minors give their own consent to be tested for HIV without obtaining their parents’ or guardians’ consent? · CONNECTICUT—the health care provider must counsel the minor to work towards involving the parents or guardians and about the need to notify partners. · MAINE & NEW HAMPSHIRE—the physician is not required to but may inform the minor’s parents or guardians, so it is important for the minor to have a conversation with the doctor about his/her policies on this issue. · MASSACHUSETTS—if the physician feels that the minor’s life is in danger, then the doctor is required to notify the parents or guardians. 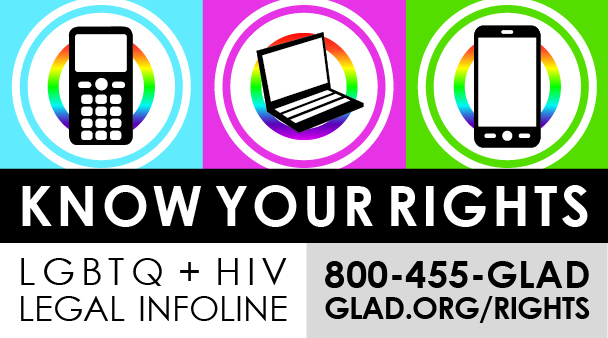 If you have any questions about LGBTQ/HIV legal issues, please contact GLAD’s Legal InfoLine—by email or live chat at www.glad.org/rights/infoline-contact or by phone at 800-455-GLAD (4523). This is a free, confidential service, and you will be assisted by a compassionate, highly trained volunteer.